Destiny Bohanon prepares to score a 3-pointer against Beavercreek. Bohanon scored her 1,000th career point during the victory Thursday night. Lovie Malone drives towards the paint past ‘Creek defender Kirsten Williams. Nyla Hampton tries to score inside the paint as Trinity Bean defends. Aubryanna Hall scores midway through the fourth quarter against Beavercreek. HUBER HEIGHTS — To say that the Lady Warriors are not the same team that lost 54-53 to Beavercreek on Dec. 5 would be an understatement. Thursday night Wayne jumped out to an 18-4 first quarter and 36-11 halftime leads and never looked back in a 70-32 rout of the Beavers. 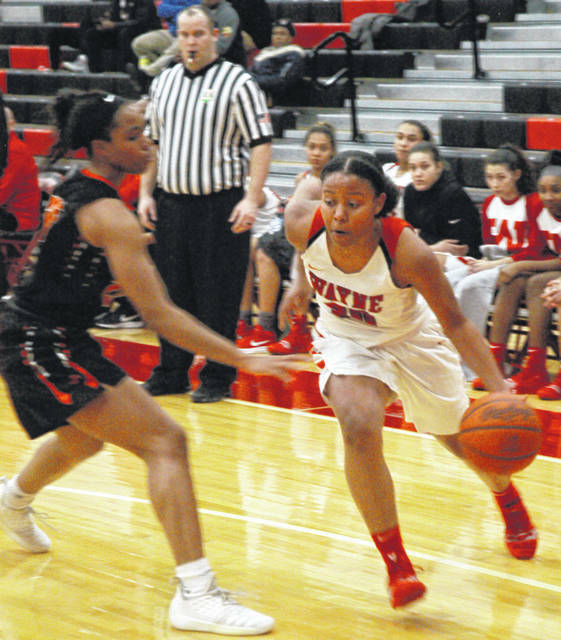 Wayne’s dominance saw the score swell to 53-18 entering the fourth quarter. 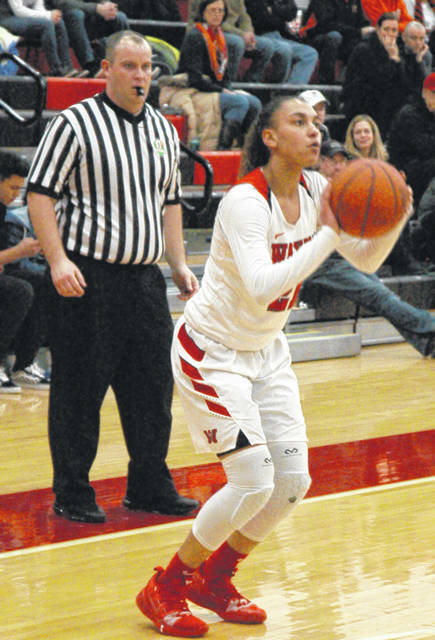 The victory was Wayne’s sixth straight with two scheduled regular season games remaining with Springfield and Centerville. Wayne has four games it would like to make up. Belmont failed to show up for a game on Dec. 19. Bad weather cancelled a game with Trotwood-Madison on Jan. 12 as well as a trip to the Country Classic at Berlin High School vs. Canton Glen Oak and Pickerington Central on Jan. 20 and Jan. 21. Trotwood-Madison has expressed no interest in rescheduling its game with Wayne and the three other missed contests would be difficult to fill unless a willing opponent could be found. That is frustrating for Trice who would like to see his team head into postseason play with a full slate of regular season contests under its belt to fine tune things before entering tournament play. “The camaraderie of this team is good, the bond is strong and obviously we’ve got the talent and I love seeing where we are at right now,” Trice said. Some early to midseason injuries took a toll on the team. It also forced the coaching staff to back its practices down a little in order to not wear out the remaining healthy players. 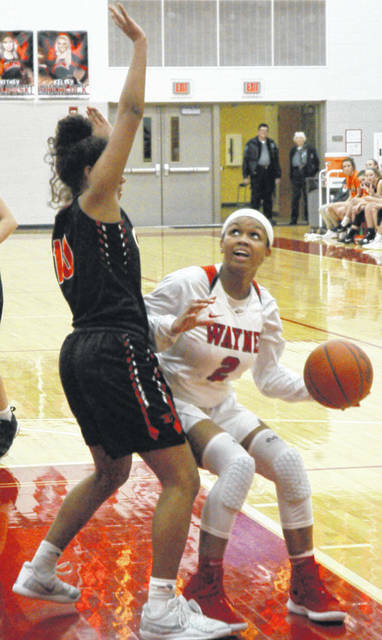 Centerville, winners of eight straight and 18-1 overall, will serve as a litmus test as far as how well Wayne is prepared for postseason play in both schools’ final regular season contest on Saturday, Jan. 9 at Wayne. Destiny Bohanon scored her 1,000th career point against Beavercreek. She and Aubryanna Hall led the team with 13 points each while Nyla Hampton and Olivia Trice each tossed in 12. Beavercreek: Maci Rhoades 2-0-4, Allyssa Hall 2-2-6, Trinity Bean 1-1-3, Tiernan McKitrick 3-1-7, Maggie Holstein 1-0-2, Scott 1-1-3, Anna Landing 3-0-7. Totals: 15-4-32. Wayne: Charity Miller 0-2-2, Nyla Hampton 4-3-12, Saharra Murphy 1-2-4, Kyra Willis 3-3-9, Cydne Campbell 1-0-2, Destiny Bohanon 5-2-13, Olivia Trice 5-0-12, Aubryanna Hall 5-2-13, Lovie Malone 0-3-3. Totals: 24-17-70. 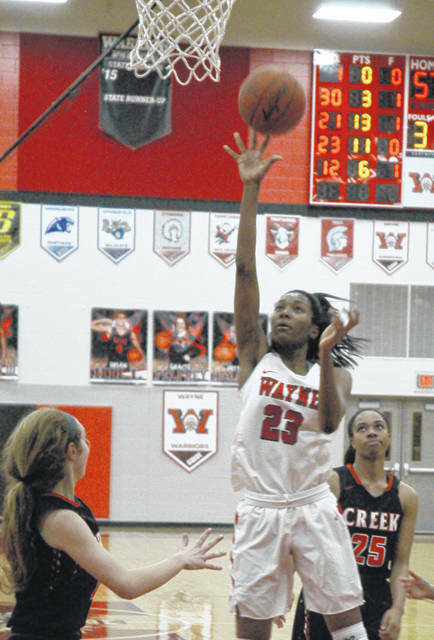 3-point goals: Beavercreek 1 (Landing), Wayne 5 (Trice 2, Hampton, Bohanon, Hall). Records: Beavercreek 12-7 (6-4), Wayne 12-4 (8-2).